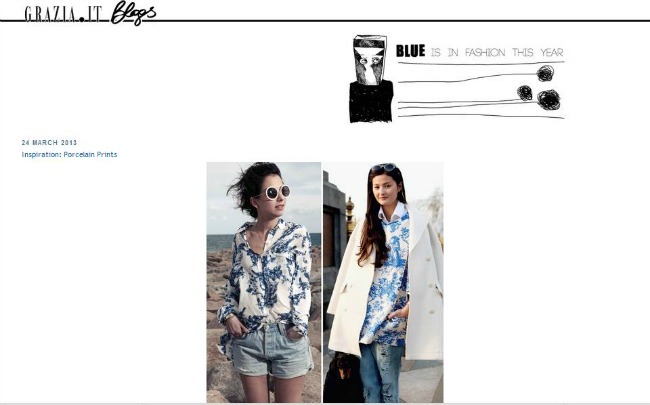 Blue is in Fashion this year is one of my favorite blogs. Actually it´s in my inspiration list (on the left side bar) I love it because it is a quick way to see what going on in the streets and the content is great!. Today, like every day, I entered to see a post related to porcelain print, which I am totally in love with, and I found my picture!. It may seem silly but it's an honor for me to be referred to an actual trend and that can be used as an inspiration to thousands of girls in cyberspace. Woww Felicidades Milagros!!!! te lo mereces!